We're located 1 1/2 hours north of Toronto, Ontario, Canada. From Toronto you can travel up highway 400 to Barrie, then continue up the highway 400 extension to highway 93. Take highway 93 and before you know it you're here. 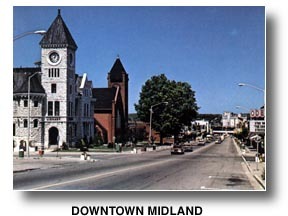 Here is a link with the up to date local weather forecast: Weather Network forecast for Midland . Located on the southern shores of the "inland fresh water sea", Georgian Bay, our trading area has a permanent population of approximately 36,000 friendly, hardworking people. In the summer, thanks to our booming tourist trade, our population often triples. Midland and Penetanguishene, two distinct communities, rich in history (Penetang is Ontario's oldest town) are actually less than 5 km apart. Midland's permanent population is 14,500 Penetanguishene's 5,000. We are however, more than just a tourist destination. High tech industries abound in our region. Midland, in fact, is home to Canada's only Industrial Research and Development Institute specializing in leading edge technology for the tool and dye industry. We have plenty of quality schools in both official languages, our hospital is new, there's plenty of shopping close by and Real Estate prices are very reasonable. Older, stately homes. Some remodeled and some left in their natural splendor. Modestly priced bungalows and two storey homes. More expensive, newer homes with all the modern conveniences. Outside these major centers are several smaller villages that many families have chosen because of their even more reasonable home prices. These villages include Port McNicoll, Victoria Harbour, Waubaushene, Perkinsfield and Lafontaine. Other people have chosen to live in the country where there are an abundance of homes and farms on beautiful lots and small acreage. You'll also find more expensive waterfront homes in these area that enable you to enjoy "the bay" to it's fullest. It has also been noted by many people that are either retired, or approaching retirement, that the Midland - Penetang area is a wonderful place to retire to. It's beauty, reasonable housing costs, excellent health care facilities and close proximity to Toronto are all reasons that they have chosen to live here. Midland offers 6 elementary schools and 2 secondary schools and bilingual education facilities in the neighbouring community of Penetanguishene. Georgian College of Applied Arts and Technology has a campus in the community. Many of these institutions do have web pages. Check out their links in the Hot Midland Links. Police protection: 25 police officers enforce the criminal code both on land and water. Fire Protection: 14 full time firefighters and 20 volunteers with modern equipment and emergency vehicles in Midland. The community offers four seasons of recreation with beaches, 11 yacht clubs that offer 3,300 wet slips, 3 golf courses, tennis courts, fishing, downhill and cross country skiing, snowmobile trails and much more. The new waterfront trail in Midland will provide opportunity for walking, roller blading, biking and cross country skiing. The local YMCA has an Olympic sized swimming pool, there are also modern recreational complexes in Midland and in Penetanguishene, as well as two curling rinks and numerous community and neighbourhood parks. For you shoppers there are 3 malls accommodating over 150 retail stores. Since tourism plays such a large part of our life in beautiful Georgian Bay, I have included many links to the various attractions in the Hot Midland Links page. Also to be found here are links to the schools, a local newspaper, the chamber of commerce, and some of the many merchants that are happy to serve the area all year long.